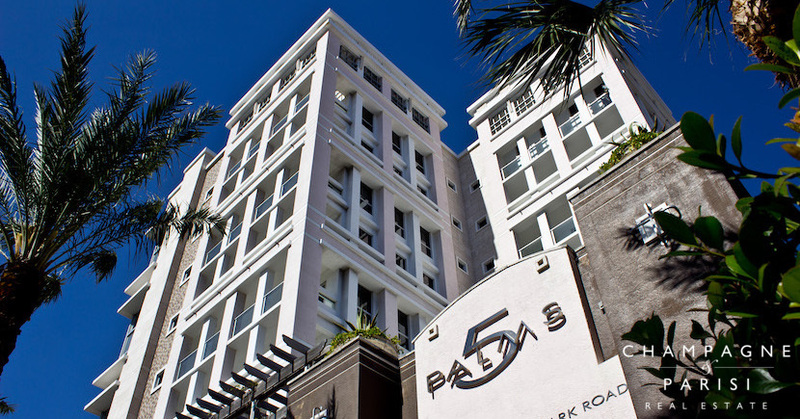 5 Palms is an ultra-chic, New York-inspired high-rise condominium residence located in the heart of Downtown Boca Raton, FL. Built in 2008, this nine-story boutique condominium building features just 16 private residences offering urban luxury condo living within a picturesque tropical downtown setting. There are 16 private residences in this nine-story boutique luxury condominium building, with a variety of floor plans from which to choose. 5 Palms condos range from 2,500 to 2,800 square feet in size, offering units with two to three bedrooms, as well as penthouse units with 2nd level lofts. Each luxury condo has a private access elevator and private balconies offering breathtaking views of the surrounding cityscape and the Atlantic Ocean. This state-of-the-art building has hurricane impact glass doors and windows throughout the building and lavishly landscaped grounds. The zen-inspired lobby offers a soothing transition from the outside world with its intimate ambiance, cascading waterfall, handpainted Erte Inspired mural, and beautiful Venetian plastered walls. 5 Palms has a rare stainless steel outdoor pool that can be chilled in the summer and heated in the winter, as well as his and hers cabanas and changing rooms. The fitness center includes top-of-the-line fitness equipment, as well as personal training membership. Other amenities include concierge and valet services, closed-circuit security system with surveillance, and keyless entry. 5 Palms is also a pet-friendly building with in-house dog walking service available. 5 Palms Boca Raton is located 455 East Palmetto Park Road in the heart of downtown Boca Raton. The building is just steps to the Atlantic Ocean and minutes away from the Boca Museum of Art, Mizner Park & Amphitheater, iPic cinema, upscale boutiques, trendy cafes, and fine dining restaurants. If 5 Palms sounds like the perfect place to call home, you may also want to visit similar downtown condominiums including Townsend Place, Tower 155, and 200 East, which also offer luxurious condo living in the center of all of the action and excitement happening in Downtown Boca Raton. If you are interested in purchasing a condo for sale in 5 Palms, or any of the surrounding downtown condominiums, please contact us at 561-235-7800. You may also reach us by completing our simple online contact form provided below and one of our luxury condo specialists will reach out to assist you. We at Champagne & Parisi Real Estate look forward to assisting you in finding your next dream condo in beautiful Boca Raton, FL! Also, please consider registering for a free account which will enable automatic notifications to your email when new condo listings that meet your search criteria hit the market. WHAT IS MY Condo's Value? Estimate your condo's current value and suggested selling price.